We’ve marched, We’ve rallied, We’ve registered and identified voters, now it’s time to Get Out the Vote (GOTV)! GOTV kicks off with the start of Early Voting (October 22-November 5 in Illinois), The more supporters who vote early, the fewer we need to track on Election Day. Still, that Last Weekend can be expected to be our busiest. Historically when Democrats turn out, they WIN! In the last weekend before the midterm elections, we’re going to show everyone the power of the blue wave. Commit to canvassing on the final weekend before election day. We will be getting out the vote for progressive candidates all over Illinois and into Indiana and Wisconsin. Write personal notes to fellow constituents in key districts to remind them of what they need to do to get ready for the midterms. Click below to find dates, times, and locations, join a party, or promote a party you've scheduled. Join our LAST Postcard Posse Night! Call voters to remind them how important it is to vote. We target key swing districts and call on behalf of progressive candidates. 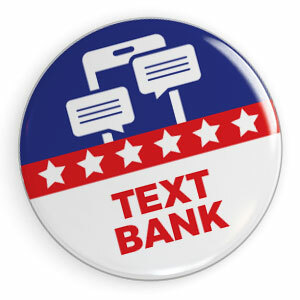 Text prospective voters from the comfort of your own home. This is similar to canvassing, but with less walking. You’ll help reach key voters and mobilize activists around critical electoral work. If you can’t knock doors or make calls, but can drive, this is a great way to be involved. Rides to the Polls or also know as “Souls to the Polls” has a long history of providing voters with free transportation to the their local polling site. This tactic dates back to the Civil Rights era, where so many people had to fight for their right to Vote (and in many ways still are). Voting early frees up your time to help other supporters exercise their right to vote. Chicago in-Person early voting runs September 27 thru November 5 at the Loop Super Site and October 22 thru November 5 at the 50 Ward Sites. Two forms of ID are needed to register and vote in person for the first time. In Illinois, anyone can vote by mail; no reason or excuse needed. On Election Day, voters may cast a ballot in their precinct between 6 a.m. to 7 p.m.
There’s a LOT to do, but not everyone has the time. If you can’t participate in these activities but want to make a difference, please Donate so we continue to do the work!